Imagine Amherst is a project to reimagine and improve commercial and mixed-use centers in the Town so that they work better with surrounding neighborhoods and encompass the vision that residents desire. This project aims to update the Town’s Comprehensive Plan and Zoning Code, which may not be producing the types of development desired by the Town or its residents. The goal is to uncover the community’s future vision for existing commercial and mixed-use centers within the various neighborhoods in town. As people’s lifestyles, habits and use of new technologies drive the economy and create different ways to live, work and play, we must anticipate the community’s needs. Once this new vision is established in the Comprehensive Plan, the Zoning Code will be updated with corresponding language that physically creates the types of commercial and mixed-use centers the community envisions. NYSDERDA’s $161,250 grant provided towards the project, which pays for 75% of the project consultant cost, is through Governor Cuomo’s Cleaner, Greener Communities (CGC) program. The CGC program is a major statewide initiative that encourages communities to incorporate sustainability goals and principles into local decision-making and then form partnerships to transform markets to reduce emissions and generate economic development. Cleaner, Greener Communities supports projects the Regional Economic Development Councils have identified as important to the economy of the region. The program empowers communities to take action, providing technical resources and decision-making tools on land use, housing, transportation, energy, economic development and environmental practices, resulting in a more vibrant and prosperous New York. Cleaner, Greener Communities is funded through the Regional Greenhouse Gas Initiative (RGGI), the nation’s first market-based regulatory program in the United States to reduce greenhouse gas emissions. RGGI is a cooperative effort among New York and the states of Connecticut, Delaware, Maine, Maryland, Massachusetts, New Hampshire, Rhode Island, and Vermont to cap and reduce CO2 emissions from the power sector. The Town also has a contract with a consultant, Code Studio from Austin, Texas, to prepare technical products and support public engagement through the project. The following graphic depicts a general timeline for the project, expected to be completed by March 31, 2019. The project started in the spring of 2016 and the Comprehensive Plan Amendment was adopted by the Town Board on December 11, 2017. Various components of the project are currently moving forward which include meetings of the Zoning Review Committee to develop the Draft Zoning Code, public hearings before the Planning Board and Town Board, and training and education with the revised Plan and Code. 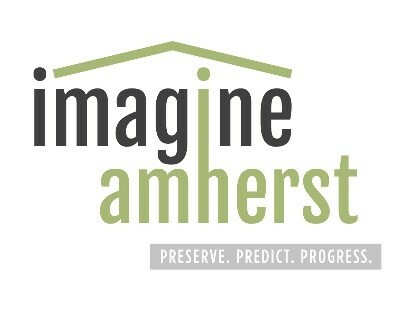 All project information, documents, and progress will be located on the Town’s website under “Projects and Initiatives” by clicking the Imagine Amherst link. In addition, be sure to check the TrackUs Announcements on the Town’s website for important information on upcoming meetings. You can also keep up with the project by visiting our Facebook and Twitter pages.